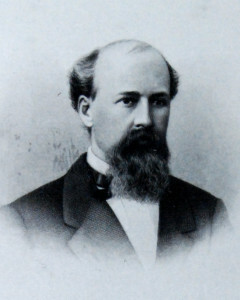 A member of the Phillips Academy Class of 1835, Gustavus Fox played a key role at the beginning of the Civil War and thereafter served as Assistant Secretary of the Navy and confidante of Abraham Lincoln. After some delay caused by members of Lincoln’s cabinet, Gustavus Fox and a fleet he commanded sailed for Fort Sumter on April 9, 1861. His expedition also was further delayed by a significant storm. Knowing the re-supply expedition would soon be approaching, Jefferson Davis ordered Confederate General Pierre Beauregard to demand the surrender of Fort Sumter. After being informed that Fort Sumter would surrender on April 15 unless re-supplied, General Beauregard gave the order to fire upon Fort Sumter on April 12, 1861. When the cannonade began, Gustavus Fox was just 10 miles away at sea. Thus, the Civil War began. After the War, Fox worked for the Middlesex Company and lived in Lowell. He died in 1883 only one year after he had written an article which theorized that the first land Columbus had reached in North America was in the Bahamas. Fox’ article received scant attention until National Geographic concluded over 100 years later that Fox likely had been correct.